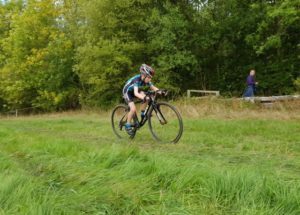 The weekend of 15th and 16th September was a successful weekend for Otley CC with wins in circuit racing and time trialling and good performances in cyclo cross. 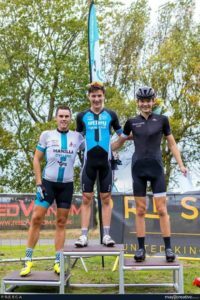 James Veitch got the weekend off to a good start riding the 3/4 Category event at the Manilla Presca Autumn Series #2 at Middlesbrough Sports Village on Saturday 15th. 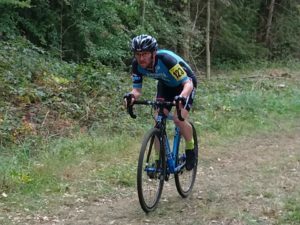 James had already taken 3 points for 7th place in the first round of this series on the previous Saturday – full results courtesy of BC here – so had something to live up to and certainly did that at round 2, and below is a brief résumé of his race. Photographs courtesy of Mayo Creative. 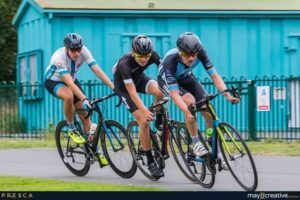 “An early attack with another junior rider and an older rider meant that the main group was caught off guard and we managed to build a solid lead of nearly 1km throughout the course of the 1 hour crit race. 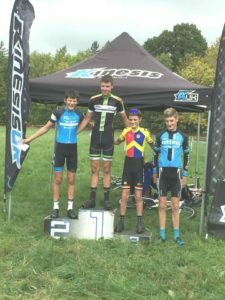 Well done James on your maiden victory! Full results still to be published. 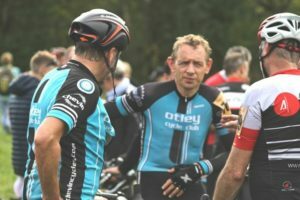 Otley CC weren’t only competing in time trials on Sunday 16th September but were also involved in running an open TT of our own. 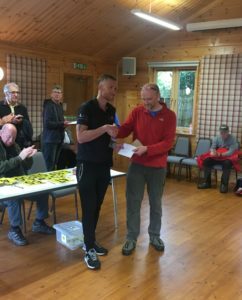 First event of the morning was Round 10 and the finale of the 2018 corsaRosa League and the possibility of Otley winning three categories overall. On a morning that promised rain but was fine instead but windy, aptly the three Otley riders competing were all in with a chance of being individual champions and on the V810, the hilly of the two corsaRosa courses, Helen Coutie and George Radcliffe were both able to defend their lead in two of the categories. Helen was fastest woman on the day with 32:29 which saw her crowned 2018 AcciaioRosa (steel framed bike) Champion. Keeping it in the family, George was fastest youth in 30:21, meaning he became 2018 Youth Champion. 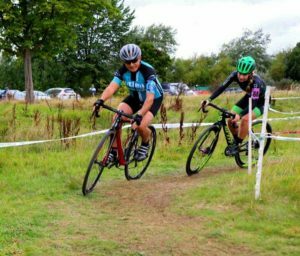 Amy Cuthbertson was first Otley rider away, vying for the top position in the Women’s category with albaRosa’s Ailish Graham. Sadly, although Amy beat Ailish by 7 seconds – 33:59 to 34:06 – Ailish was crowned 2018 Women’s Champion by just 1 point. 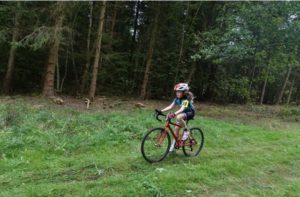 An excellent performance though by Amy in her first time trialling season, boding well for 2019. Helen finished 3rd Woman overall and Chris Radcliffe finished 5th in the AcciaioRosa category. 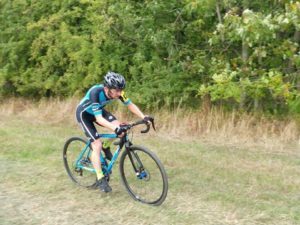 Otley had eight riders in the Men’s overall table – James Cullen 8th, David Bennett 16th, Chris Radcliffe 23rd, John Barnett 24th, Andrew Bolton 27th, Paul Evans 30th, Michael Cuthbertson 33rd and Andrew Smith 35th, many of those not able to ride the maximum six scoring events. Overall Men’s Champion is Russell Brown of Yorkshire Road Club. 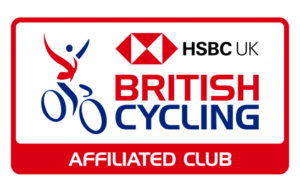 Despite the lack of qualifying events for some Otley riders, the club managed to finish 2nd in the Club standings behind albaRosa. Congratulations to Otley CC’s champions and well done to all who rode. Thank you to those who supported the league, especially sponsors Woodrup Cycles and Spokesman Cycle Clothing, and to Spirit and of course La Stazione in Ilkley. Round 10 results and all final standings, courtesy of the corsaRosa Facebook page, can be found here. The end of league breakfast and awards are being held Sunday 23rd September at La Stazione. 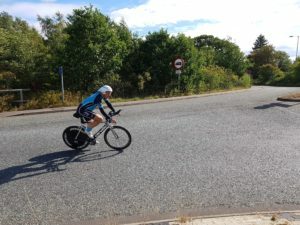 That same morning but starting 2 hours later at 10.00, Otley CCs Open 25 Mile TT, expertly organised by our club long distance specialist Martin Tallontire supported by family and clubmates, was held on the A168 between the Walshford and Boroughbridge roundabouts. Again, a rain free morning but the ever changeable wind made the longest leg from the Boroughbridge roundabout to the 2nd circumventing of Walshford roundabout a slog, a saving grace being a slight help up the infamous Red Wall. Fastest Otley rider in 9th place and fastest Junior was Joe Howcroft in 1:02:25. 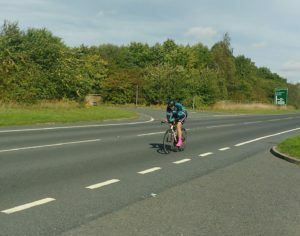 Dad Tim recorded 1:08:59 and Helen Goldthorpe, winning the award for 3rd Woman, finished in 1:10:24. Photograph courtesy of Liam Mealey. 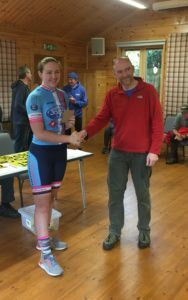 Aerocoach rider Andy Jackson was first Overall in 55:05 and Louise Scupham of Team Jadan-Weldtite p/b Vive Le Velo was fastest Woman in 1:08:59. 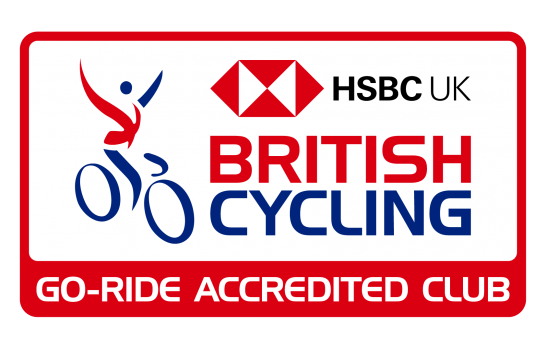 Full tesults and report courtesy of CTT and Snowdon Sports. Thank you to Martin for organising the event and to the timekeepers, marshals and helpers. Selfie courtesy of Christine Bell. 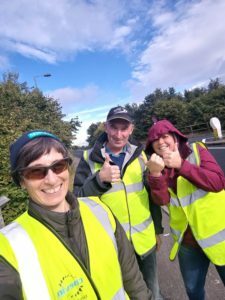 It’s always good fun marshalling! 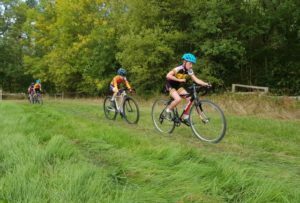 Yet another event involving Otley CC riders on Sunday 16th September was Round 3 of the Yorkshire Cyclo Cross Association Winter Series, held this time at Camp Hill Estate at Kirklington near Bedale. Stuart Hall and Tony Wild have kindly provided reports on the Bedale ‘cross. See if you can guess who wrote what. No prizes, although a thesaurus can be loaned if required. Photographs courtesy of Helen Goldthorpe, Stuart Hall and Tony’s mate ‘Jonny Tomez Gomez’. “Again, some notables absent due to conflicting TT interests. I’m hoping they and a few others will pitch up soon to swell our numbers and ahem….. raise the bar. “In the mean time it remains Dexter Leeming-Sykes’ duty to show us how it’s done. Alas…. no chicken dinner or podium this time for Dexter, though I do see him sneaking into an imaginary 4th step on the podium shot. Close…. but no cigar Dexter….. next time eh…. “Our next ‘hitter’ James Cullen…. or is it Ian? his identical twin bro……? Can’t tell ’em apart can you. James…. for it is he, excelled on the flat dry course bringing his TT skills into play to finish 31st MV50. I know he was pleased with that as he was bragging about it on Stravalopolis before the results were published! (Not forgetting Andrew Moxon, making a return to ‘cross after some time away). “Me? 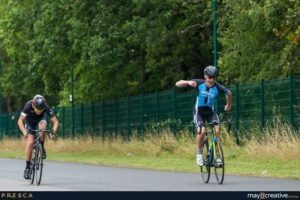 I haven’t got any TT skills, preferring a more uppy downy type course to get me breath back on…..
“A welcome return to the ‘cross scene for Liam Mealey who alas DNF due to a ‘mechanical’ (puncture) half way round”. 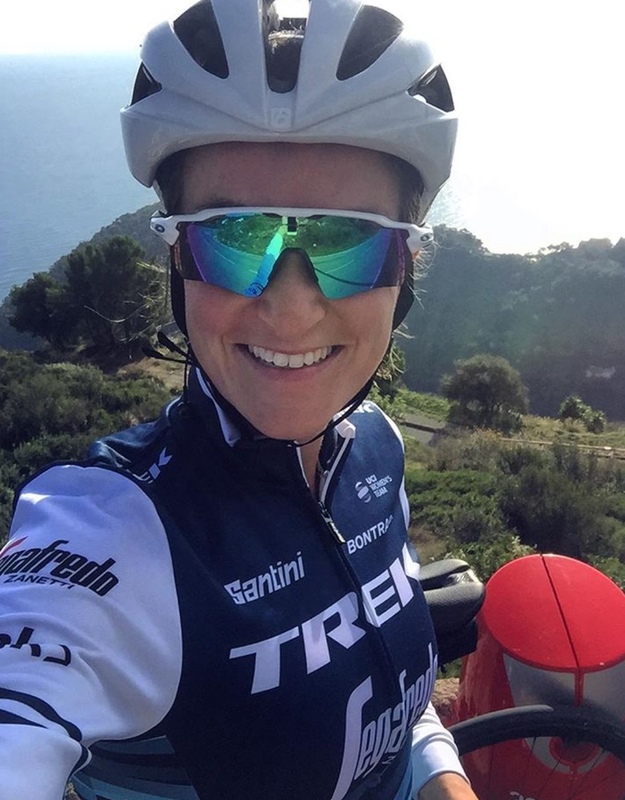 “Hoping to see Claire Jessop ‘crossing over soon after seeing her new ‘cross bike acquisition on Facebook. 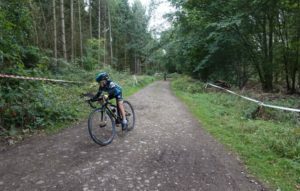 “After the complex, twisty course at Wyke, this week’s race in a remote woodland near Bedale in North Yorkshire couldn’t have been more different. 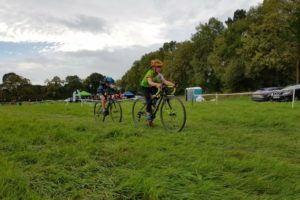 “The U12 categories had a level, firm 1km course with only half a dozen corners in the entire lap, characterised by a fast out section and a very rough, grassy return with a grassy field to complete the lap. 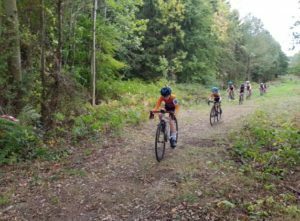 This led to some very exciting racing, with drafting tactics from the track coming into play, especially considering the stiff headwind on the last section of the course. Andrew Moxon MV50. 83rd overall, 43rd category. Full results courtesy of YCCA. Next round is at Temple Newsam Sunday 23rd September.